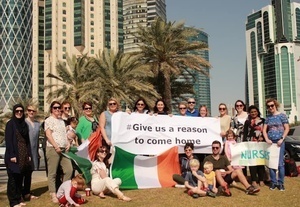 Messages of support for for tomorrow’s nurses’ and midwives’ strike from Irish nurses around the world, asking “for a reason to come home”. “I’m proud and humbled by the support of our nursing and midwifery colleagues around the world. Globally, our nurses and midwives are standing up for safe staffing, fair pay, and for our patients, who deserve better care. That’s what Wednesday’s strike is all about. 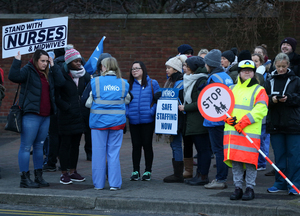 Posted in Misc and tagged INMO, Nurses' Strike at 11:37 am on January 29, 2019 by Bodger. + €6 billion (a year) on defence spending – 2% of GDP of €300bn. Compared to <€1 billion today. 1. That will never happen. We will never spend 2% of GDP on defence. 2. (and if it does) it will only happen if there is a “united” Ireland and we need to send troops to Belfast & Derry. Eamon Dunphy has a repeat of his fantastic interview with a Beaumont hospital A&E nurse on his podcast today. Really worth the listen. Thanks for the rec. Must have a listen this evening. 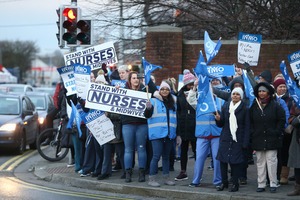 I wonder would all these nurses come home if the nurses got their 15% pay-rise? Is it really that simple? These Irish ladies (and they are mainly ladies) are generally having a nice time in a sunny place while they are young. That’s a nice way to stereotype the nurses who all emigrated for a number of reasons and to brush the reasons they did leave aside as being frivolous and unimportant. Oh please. No woman has a ‘nice time’ in places such as Saudi. They have gone to try to save money, to try to put a roof over their heads in this dysfunctional isle. Come on Cian, you’re all about the facts so please tear down that straw man! They have effectively emigrated for more reasons than salary but aren’t being as honest as they should. Ireland is a rich country, but it is not a *very* rich country. Nursing is a global labour market. 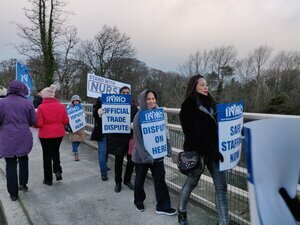 Ireland cannot afford to pay nurses the wages that pertain in very rich countries. Nurses abroad have also benefitted from big taxpayer expense on their university education in Ireland. I find this a little hard to take. compared to Oz and the UK?! 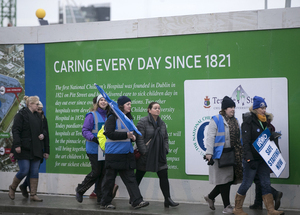 The London picture appears to show less than a dozen Irish nurses bothered to complain. Wages and taxes are similar in the UK (as, like Ireland, it has a big social welfare system) so my point is obviously about the further-flung destinations. Okaaaay….how is Australia that much crazy richer than Ireland? Whatever the arguments on whether Irish Nurses pay is high or not, it’s the cost of living and quality of life. Not much point in being paid €60k or whatever if you have to drive 2 hours to work and have a jumbo mortgage for a semi-d in the midlands. Fupp that! The cost of living and in particular housing is the main issue. Property is sucking money out of everything and will again drag the country back down with it. Couldn’t agree more. If anything more public sector pay rises will only fuel the fire worse. The bit that always gets me is they knew exactly what they were getting in to before they signed up. I’m sorry if I’m sounding unsympathetic to this cause here but we’re all in the same boat. Playing the essential worker card don’t cut it either, Bin men are essential workers. People who drive vans delivering nappies to old folks homes are essential workers. Where does it end! Why don’t we just pay everyone more than the going rate. We need to concentrate on fixing the housing mess – not throw money at public/civil servants. The cost of living in Ireland is the real problem, next to housing, childcare costs, insurance gouging. But if you are training generations of nurses to just leave every year, then you have systematic problem also. All the same reasons to come home, or not, as for any other careers. Just as an add on to that. Don’t they always say nursing is supposed to be “A Vocation” Yeah vocation so long as it’s in some of the best paying parts of the planet it looks like according to those pictures. We’ve enough moaners here thanks. Isn’t public representation a “vocation” too? Let’s swap the pay nurses get with TDs and senators (including the generous expenses regime)and see how vocational politics would be. Just slightly off topic but the other half ended up going to Tallaght A&E last Saturday at 1 in the morning for a suspected arm fracture. Dreading what we would see and have to go through while going up in the taxi, it turned out to be fine. Triaged, X-ray, cast put on and out the door in 3 and a half hours. Was expecting Sodom and Gomorrah, turned out quite pleasant. Well some people would find Sodom and Gomorrah quite pleasant. That was the idea. Stay where ye are folks, this country is rotten to the core all ye’ll get is double your hours for half your pay. My student nurse relative on her 4th and final year will be working in a hospital doing shift work and get paid over 7 euro an hour. When qualified her pay will be 14 euro an hour. That’s not well paid considering she has 4 years of college completed. My recently qualified primary school teacher relative pay is 26 euro an hour. No shift work, every Christmas/New Year off and long summer holidays. Clearly , the pay system is nuts. It isn’t fair to compare hourly rates for teachers v nurses. A nurse will earn extra money for shift-work, working Christmas, overtime, etc. A teacher gets a set wage. While the working conditions are bad so I this slogan. Yeah, you were forced to live in Saudi Arabia…right. I believe working conditions (and accommodation) are bigger causes for departure than wages. What nonsense. Excusing London, I don’t believe any of those people in other countries have any real desire to come home unless they have fallen on hard times. Better paid, better standard of living and better weather. Its not like leaving Ireland meant they’ve forced to work in a labour camp in North Korea. 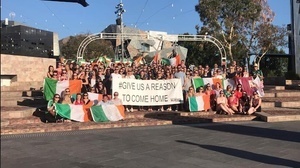 These will be the same people that will come back and then write an opinion piece for one of the broadsheets, (like they do every December), saying Ireland hasn’t welcomed them with open arms and they are leaving again. As long as they have someone to send them their Tayto crisps and their Barry’s Tea so they can put up fake nostalgia posts in their instagram, they’re grand where they are. Great to see you’ve started off with an open mind. Nice to see the usual two or three blueshirt morons trying to pull the debate off topic. Same ones think Leo ‘soulless’ Varadkar is worth it. 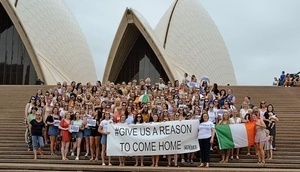 Jebus, look at the crowd in Sydney, which is presumably a small subset of the total number of Irish nurses in Oz. 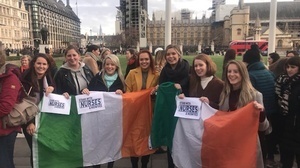 Are they all nurses who have been educated and trained in Ireland? What a disgraceful waste. 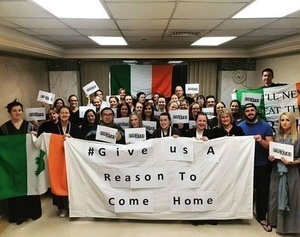 Fair play to the Irish nurses for standing their ground, especially if the ultimate concessions encourage just some of these nurses to return home.